This adorable little dress has become a favorite of mine. I finished it a while ago but didn't get around to putting the finishing touches on it until yesterday. I whipped up a flower for it in a pretty variegated pink yarn and added some leaves. It adds so much to the dress. I really like the way this turned out. I'm eager to make more of them. Simple but still lacey, elegant, and classic. Looks like I need to go out and buy some more white baby yarn. It seems I'm a bit obsessed crocheting baby clothes. But I can't help it. It's what I'm drawn to and I get so much pleasure out of it. So I might as well continue doing what I love to do rather than making something else I'm not interested in. It just wouldn't be quite as fun. The weather has been nice here in the Texas Panhandle. We've had a couple of non blustery days. The wind is always blowing around here so when it's nice and calm we feel really blessed with a nice day. We got a good rain this morning with more in the forecast. My flowers will certainly like that. It's so much better for the ground than city water. It makes everything grow faster and look better. So thankful! Hi, I love this dress it is so pretty. It was so nice to see you at the Crochet Happy Linky Party! That dress is just precious. I love it in white with just the touch of pink! Your Clematis is beautiful also. Thanks so much for sharing with SYC. 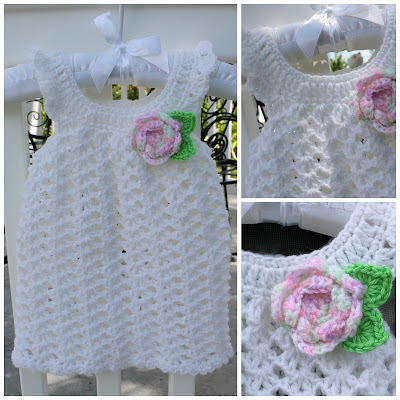 Three girls in the house and a crocheting mum - I think it's time to make some crocheting dresses for the little ladies. Thanks for your inspiration. Your dress is lovely.